Long time no see! I'm still here, just occupied with stuff like yoga, reading awesome books, working, therapy, drinking tea etc :) Looking forward to start writing here again though! I have so much to say about my yoga teacher training which already feels completely life-changing even though I'm just a few months in. I'm also inspired to create a few new recipes now that it's actually bright enough to take decent pictures (thank you, spring!). Today was a really nice day off work. I've spent the entire day at home, doing yoga, cuddling with my love, reading and eating lunch with friends. Now it's soon dinner time, probably in front of some good old HBO. We just started watching "The Path", anyone seen it? Finally sunshine and spring feelings! We still have an awful amount of snow on the grounds, but it's disappearing little by little every day. The last couple of days we've been able to sit in the garden enjoying the sunshine, drinking tea, reading books. So to today's recipe, which isn't really a recipe at all. This is just a simple salad I threw together with some stuff lying in fridge and cupboards. Fresh spring food! I also served my salad with some hummus. And dark chocolate for dessert of course :) And yoga studies. Perfect lunch! Sweden is very cold and very snowy right now. Yes, it's a beautiful winter but I am NOT a winter person (cold weather is not my thing... Am I living in the wrong country or what?). So long story short I really long for spring and summer and can't wait for warm sunshine on my skin. So what has that to do with tropical oatmeal? Well, first of all oatmeal is very warming. But most importantly tropical flavours like mango and coconut make me think of warm summer days, bare feet on the grass and happy lazy days off work. So basically sunshine in a bowl of oatmeal. Enjoy! Put all the ingredients into a small saucepan and cook on low heat until all the liquid is absorbed. 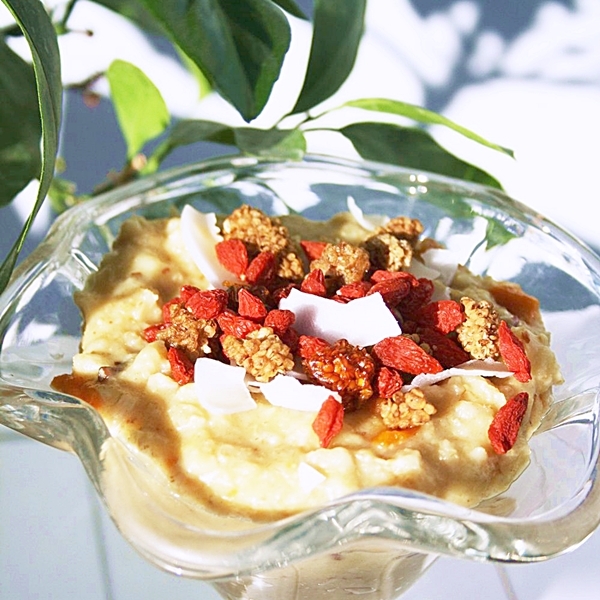 Serve in a bowl topped with coconut chips, goji berries, mulberries or more dried mango. One of my favourite activities the last few months has been mala making. I even opened a Tictail shop with some of my pieces. All the beading and knotting is so incredibly therapeutic for me, almost like a meditation. It's very much "me-time" and I usually put on some mantras or other nice music in the background. What I've realised this year is that it's so important to have a hobby. As a perfectionist and sometimes over-achiever my life has often mostly been about all the "musts" like studying/working/exercising/cleaning/cooking etc and far to little play time. But to feel good I have to nourish my soul on a daily basis, at least at this moment in my life. I feel happiest when I'm creative so now I try to make room for creativity every single day, whether it may be mala making, writing, photographing or some other activity I enjoy. I also do yoga and meditation every day which has been essential for my wellbeing. I do realise that I'm privileged (for lack of a better word) to have so much time for these things every day. I don't have any kids who needs my attention. I only work half time right now (I'm on half time sick leave at the moment, which is another story for another post). But I've come to realise that I need these things to stay/get well. Listening to what I really need rather than just push through is pretty new to me, and it's certainly a practise. It's so easy to feel selfish when you focus so much on yourself. But in reality it's the complete opposite of selfishness! Taking care of myself is an imperative for being able to take care of others and to nurture my relationships. So, back to the malas. To get started I would simply suggest to search the web for ideas and/or tutorials. Try searching for "how to make a mala" or "mala diy" or similar. Use those tips for inspiration and then just play! Be creative with techniques and beads and colours. I use semi-precious gemstones like amethyst, rose quartz, rhodonite, lapis lazuli, jade etc and sometimes also sandalwood. As seen in the pictures there's a knot between every bead, which can make the process quite time consuming but in a good way! Like I mentioned before it almost becomes a meditation, and I also feel that every mala is really made with so much patience and love.